Wine World’s Andrew Benjamin recommended this to me. I guess he thought I needed a little Jesus. I’ve reviewed some Evil Twin brews before. These brews are the work of gypsy brewer Jeppe Jarnit-Bjergsø who uses brewers from his native Denmark and just about any where else in the world. His website lists a ton of brews that he has brewed in the US, France and Denmark (and I’m sure many more countries). At 12% this is one of his stronger brews. He has produced Even More Jesus in bottle and cans through several breweries including South Carolina’s Westbrook down in Charleston. This canned brew is from Stratford CT. Not sure which brewer in Stratford produced it for him. This is the first Evil Twin canned brew I’ve seen. I’ve always seen bottles. It has a similar label to the bottles found on the web. This limited release brew has been released many times over the past 5 or 6 years. He refers to Jesus in several of his names. Double Barrel Jesus (another Imperial Stout), Even More Jesus Port (barrel-aged Imperial Stout), AÚN MÁS A JESÚS (an Imperial Stout brewed in Spain) and Michigan Maple Jesus (An American Double/Imperial Stout that I found doing a web search). Never heard of Jesus turning water into beer so I’m not sure where the reference comes. I wouldn’t mind finding out over a nice brew some day. I like this brew but at a full pint and 12% ABV you have to nurse it. This is one of the darkest brews I’ve ever poured. Dark brown head. The sweet chocolate and coffee hits you hard on the start then slowly drifts to bitter on a long finish. I mean long finish. If you don’t eat something you’ll be tasting it 3-4 minutes later. It coats your tongue and your mouth. Very malty and obviously smooth creamy mouthfeel. The malty flavors start with chocolate, after about 10 seconds the coffee kicks in and after about 20 seconds the hops start to sneak in. I poured in a frost glass. I really like this brew but I know I couldn’t drink it daily. I could enjoy this once a month especially if I got no particular place to go. We had nibble night for dinner so I tried it with various nibbles. Nice with pizza, nice with carrots and hummus (I haven’t found many brews or wines that pair up well with carrots). I tried it with some parmesan crisps (I make my own by putting some cheese sprinkles on wax paper and tossing it in the microwave for a minute). Didn’t pair so well with those. As the brew warms up the coffee starts to overtake the chocolate faster than before and the bitter finish shows up a bit sooner. I tried to see if any aromas jumped out but I made the mistake of sipping first. I think the overwhelming flavors messed my nose up. I couldn’t pick out any of what I expected to find. A purist would probably have served this at a warmer temperature to start. I like to start cold and see what happens. 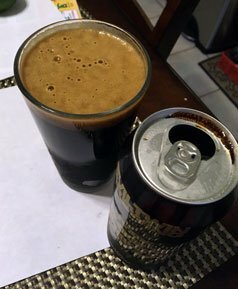 At $3.51 a pint can I feel lucky because I found a review from back in 2012 where the guy said he paid $11.49 for a 11.2 ounce bottle. WHOA! The Evil Twin website says they have a Pappy’s Even More Jesus which is aged in Pappy Van Winkle bourbon barrels. Damn. I need to find some of that.